Edited by: Rose Marie Beck, Frank Wittmann. With contributions by: Eric Adja, Uwe Afemann, Jules Bagalwa-Mapatano, Rose Marie Beck, Sandra Bornand, Verena Böll, Christine Glanz, Werner Graebner, Nana Grey-Johnson, Adolphe Sanon, Jürg Schneider, Wisdom J. Tettey, André-Jean Tudesq, Tobias Wendl, Frank Wittmann. 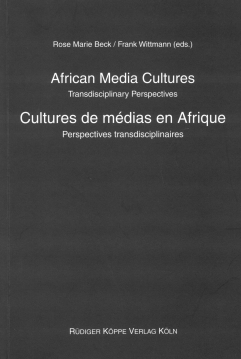 The present work represents in detailed descriptions and interdisciplinary analyses the situation of (mass) media in present african societies. Media and Cultural Studies’ paradigms of globalisation have directed attention towards the role of (mass) media in our societies. Their focus is on how forms of communication develop and are being preserved in a transnational context, how people appropriate media, and which identities they create. 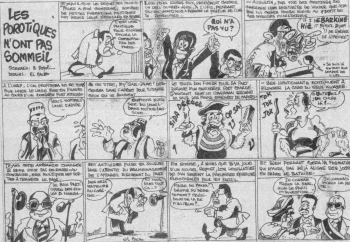 In spite of the growing importance of the notion of culture – variable systems of meaning which human beings deploy to define what things mean, and to code, organize and regulate their conduct towards one another – and its evident connection with (mass) media, African social science has not adequately dealt with the cultures of media in Africa. Few media studies are available and academia has not yet discovered the variety, diversity and originality of media phenomena. The aim of this study is to unite scholars from across the disciplines to map the media cultures in Africa by analysing their actors, forms, practices, regulations and usages/uses in past and present times. The authors intuitively have decided to treat what could be called ‘traditional’ and ‘modern’ media under one roof – bead language, the griot, advertisement, internet, cell phones, radio, (modern) art, dress, fashion, proverbs, photography, (popular) music, comics, (tabloid) press, rock painting, church windows, (horror) film or video, (praise) names, carved pot lids, books, masks, drum language, television or poetry etc. Overall, four main contexts have emerged throughout this volume – a contrast between urban and rural cultures, media as agents of social change and conservatism, aesthetic aspects in communication, and the politicisation of entertainment. The authors’ theoretical and methodological arrangement does not only offer a refreshing new perspective on the subject but also opens the way for further research. The book is a valuable contribution to communication science and African Studies and it fulfills the editor’s ideal of a comprehensive volume on the variety of media in Africa to a high degree. The volume is truly transdisciplinary in its scope and is a welcome addition to the study of African societies as complex convergences of urban and rural cultures, advanced technology, and richly diverse spiritual and aesthetic practices. Many of these short essays, written in French and English, will have a wide appeal to a variety of scholars in African studies, media studies and communication, and postcolonial and cultural studies. [...] The many changing forms of African media presented in this volume enrich contemporary discourse and cultural inquiry. Afrikawissenschaftler haben endlich die Bedeutung der Medien für die kulturellen Kommunikationsprozesse dieses Kontinents entdeckt – so der Tenor der Herausgeber dieses Sammelbandes, der neben einer Einleitung zehn englisch- und fünf französischsprachige Beiträge enthält, die das heterogene Feld afrikanischer Medienlandschaften adressieren. [...] Erfreulich ist, dass der Medienbegriff nicht allein auf technische Medien begrenzt wurde, sondern neben Beiträgen zu Massenmedien auch Aufsätze zu performativen und bildenden Künsten vertreten sind.